With a strong lineage of products under its belt, ioSafe is perhaps one of the most well-known purveyors of highly protected data storage solutions. Last year, the firm teamed up with highly-regarded NAS solutions company Synology to create the ioSafe N2, one of the first disaster-proof RAID units to hit market. 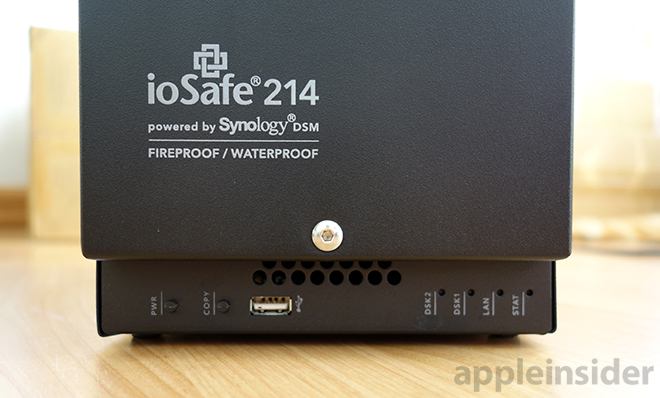 Continuing the collaboration, ioSafe has expanded its "Powered by Synology" lineup to include the 214, a two-bay RAID-enabled NAS capable of withstanding both fire and flood. Aimed at small businesses, the device is compact enough to fit on a desk, but offers both digital and physical safeguards not seen from lesser servers. For business users —and consumers who place a high value on their data —the ioSafe 214 is an excellent combination of capacity, speed and protection with a price that's hard to beat. We would classify the ioSafe 214 as inconspicuous. An unassuming monolithic black box with few visible seams and hidden ports, the NAS is akin to compact personal safes one might use to stash jewelry or important documents. Fittingly so considering this is, in essence, a safe for your data. Weighing in at 28 pounds, the 214 is definitely the heaviest two-bay NAS we've ever tested, but a majority of that added heft comes from water-based fireproofing technology, gaskets, heat dissipators, and metal cladding in which the two hard drives are ensconced. Located on the front of the unit, just below the removable front door, are power and one-push system copy buttons flanked by a single USB 2.0 port. To the right edge of the NAS are LED indicators for disk recognition, LAN connection and system status. 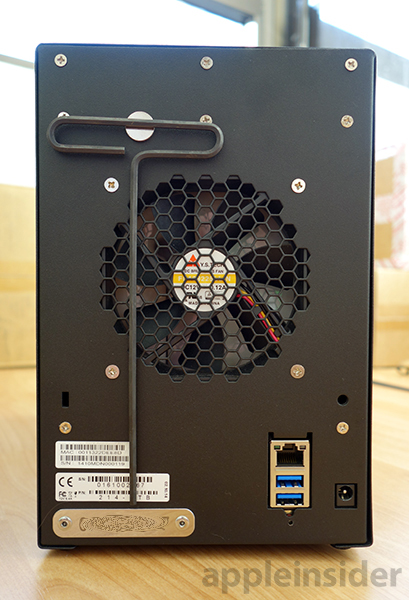 Two USB 3.0 ports and the Gigabit Ethernet port live on the enclosure's back side opposite the power port and below a generously sized fan. The 214 is user serviceable, meaning the drives can be swapped out if need be, but getting to them is obviously not as simple as a multi-bay server with integrated drive carriers. To get to the HDDs, users have to remove the fireproof/waterproof front door, a protective gasket-sealed panel and finally screws that lock the drives into their bays. While the process is not something we'd like to perform on a daily basis, ioSafe has wisely chosen to use the same H3 hex size for each screw. A removal tool is included and can be attached to the enclosure with a small magnet (also included). 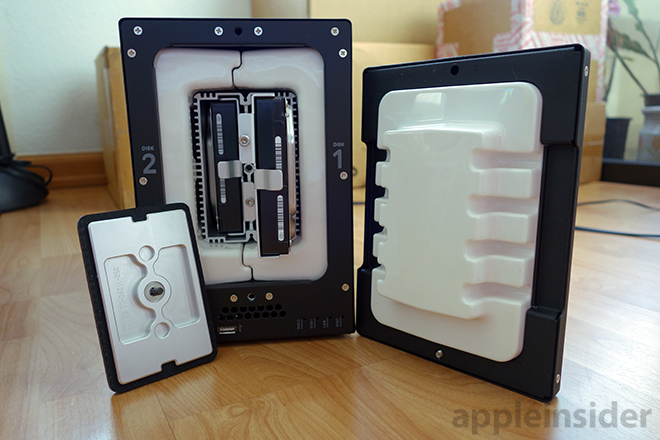 As for the drives, the ioSafe supports both 3.5-inch and 2.5-inch SATA (II) HDDs or SSDs, with our test bed coming with two 1TB HDDs built-in. The ioSafe 214's dual drive bays. According to ioSafe, the NAS can survive up to 30 minutes in a 1,550-degree Fahrenheit fire using the company's unique DataCast technology, which chemically binds water molecules in a thick layer of insulation. When temperatures inside the case rise above 160 degrees, the water is released as vapor, thus providing an endothermic cooling reaction that keeps things —moderately —cool. Complementing DataCast is ioSafe's FloSafe airflow tech. 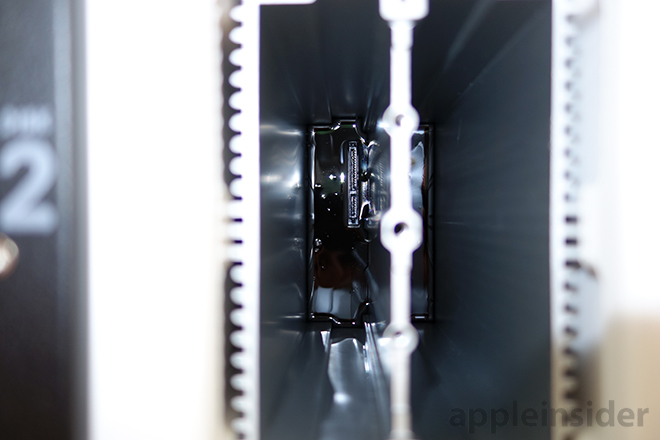 Under normal operating conditions, specially designed vents allow forced air to pass over the drive bay. If a fire breaks out, the system isolates critical components by flooding the passageways with water vapor released by DataCast. As for waterproofing, the 214 is equipped with HydroSafe tech that allows the NAS to be submerged in up to 10 feet of fresh or salt water for 72 hours. The barrier is designed to work even after being ravaged by fire, which is a good thing considering the unit is likely to be inundated with water from firefighters. Finally, the ioSafe comes with a built-in Kensington lock slot, though customers can opt to buy an anti-theft kit that comes with a sturdy padlock protected floor mount that restricts access to the removable front cover and data ports. 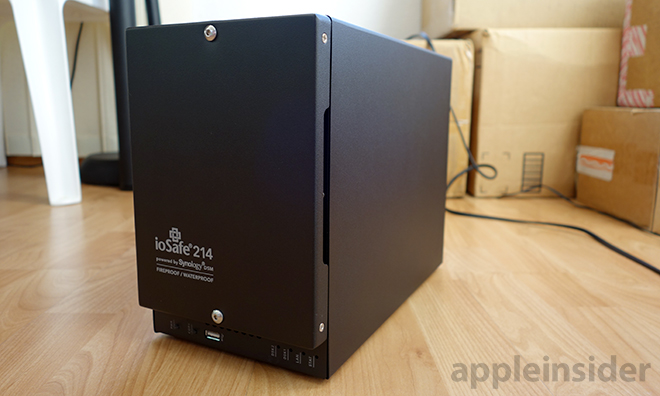 The 214 is essentially a Synology DiskStation 214+ wrapped in tank-like armor. A Synology DSM motherboard located in the bottom of the housing serves as the machine's guts, meaning users not only get a stable file serving hardware platform, but the very powerful Synology OS as well. Along with the usual host of utilities —disk setup, port forwarding and user monitoring functions, etc. —DSM comes with advanced options befitting a high-end file server, including options to create a personal cloud for syncing data between client computers and personnel. 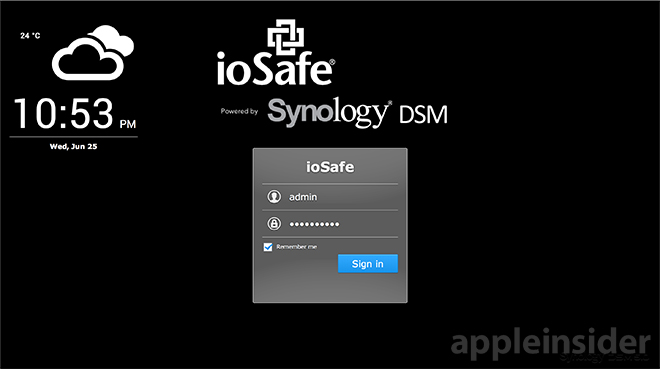 Synology's Web-based DSM control interface. 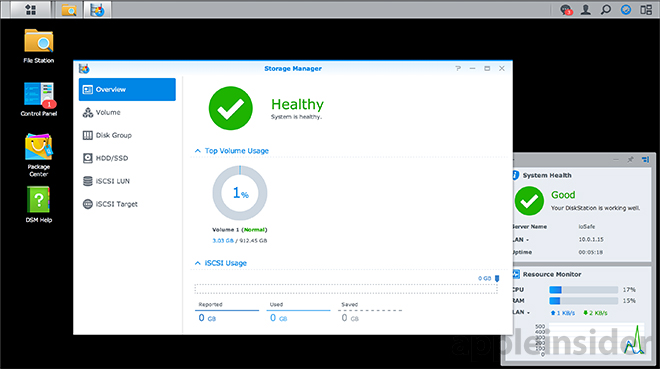 With DSM, Synology offers vanilla RAID configurations like RAID 0 and RAID 1, but the ioSafe 214 defaults to a Synology Hybrid RAID volume. In practice, SHR offers the protection of RAID 1 level mirroring with a one-disk fault tolerance (for a two-drive system), but with optimizations for performance and storage. A happy medium between RAID 0 and RAID 1. Based on Linux RAID management, SHR is more granular than traditional RAID configurations, dynamically breaking raw storage into smaller bundles that together comprise the volume seen by the end user. This bundling equates to a more flexible —and speedy —volume than one based on classic RAID. 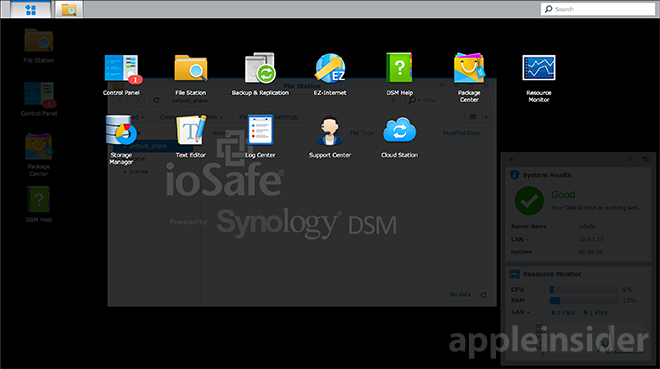 With Synology DSM, the ioSafe 214 supports Windows, Mac and NFS services, FTP, WebDAV, DDNS, LDAP services, a VPN server and more. In addition, DSM comes with built-in apps like Photo Station, Mail Station and Surveillance Station for easy file management and sharing. There is also an option for Mac owners to quickly set up the 214 as a TimeMachine for rolling OS X backups. Among the more interesting software-based services is Cloud Station, a Web-based file server that lets multiple users sync and collaborate from anywhere with an Internet connection. The system routes through DS cloud and includes the usual file sharing privilege administration offered by cloud storage companies like Dropbox. Cloud Station goes deeper than off-site services, however, allowing admins to manage client computers alongside more granular user, folder and document sharing lists. Finally, owners can set the maximum number of revisions saved to the server since Cloud Station creates a backup version of a file each time it's modified. Setting up the NAS is painless and nearly automatic with the Synology Assistant tool. After connecting to the 214 via SMB, a wizard walked us through a series of setup steps, including volume creation, client access and HDD management among other basic options. More advanced settings like RAID type, partitioning, user permissions and even case fan speed can be tweaked after initial setup is complete. 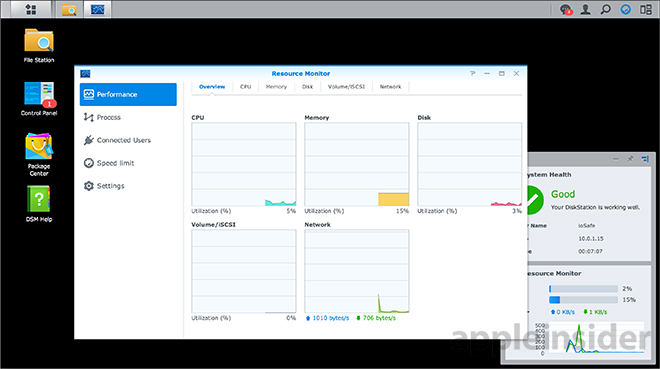 Synology also offers add-on apps that enhance the server's capabilities. Cloud Station is one such app, while others mentioned above allow the NAS to serve up audio, photos, downloads and other content via the Web. We threw a slew of real world tests at the ioSafe 214, including benchmarking and stress assessments. The server was set up in the default SHR RAID configuration, while test equipment included a late-2013 Mac Pro and a late-2013 15-inch MacBook Pro with Retina display routed through a DOCSIS 3.0 Motorola SURFboard SBG6580 modem feeding Apple's latest AirPort Extreme. Using a hardwired connection to the AirPort Extreme and connecting via SMB yielded read/write speeds that topped out at a bit over 115 MB/s and 106MB/s, respectively. At the low end, read/write transfers clocked in at a respective 47MB/s and 49 MB/s. Over Wi-Fi, average read/write speeds were capped by the connection type to around 50 MB/s and 45 MB/s, respectively. As expected, RAID 0 was faster than SHR and RAID 1, though only slightly at an average of between 3MB/s and 10 MB/s, depending on the operation. The ioSafe 214 excelled at copying files and directories and reading large files, but we recommend transferring complete files over to a workstation for completing intensive tasks like video or photo editing. While not as fast as the Thunderbolt 2-enabled Promise Pegasus RAID array, the ioSafe's speeds are comparable to, or faster than, competing two-bay storage solutions. Unfortunately, we didn't get to put the 214 in a fire or drown it in a pool, but a YouTube search of "ioSafe" will pull up multiple independent videos proving the company's claims. Powered by proven data transfer and storage technology from one of the best NAS firms in the business, the ioSafe 214 is a speedy and, more importantly, reliable performer. Add to that an incredibly tough chassis designed to withstand fire and water damage and you have one of the best on-site storage options on the market. For consumers, the $899 price tag on the version we tested may be too much to ask, but for professionals and small businesses, the unparalleled protection is worth every penny. Along with a reasonable base price, the 214 comes with ioSafe's single-use Data Recovery Service that pays up to $5,000 per terabyte (DRS Pro) for forensic data recovery and product replacement. Under the DRS terms, ioSafe will pay to ship damaged HDDs back to the firm's headquarters for data recovery, load the recovered data onto a replacement unit and send it back to the user. If recovery is unsuccessful, the company will pay out up to $5,000 per terabyte (capped at $25,000) for third-party forensics or on-site service. Whether it be for a small business, multimedia professional or consumer with irreplaceable data, the ioSafe 214 is a highly recommended investment. AppleInsider sponsor MacMall has some of the lowest ioSafe 214 prices available, starting with the diskless version that sells for $579.99. Higher capacity configurations include a 4TB (2x2TB) version with standard DRS Basic for $999.99 or DRS Pro for $1,189.99 and an 8TB (2x4TB) with DRS Basic for $2,001.00 or DRS Pro for $2,299.99. 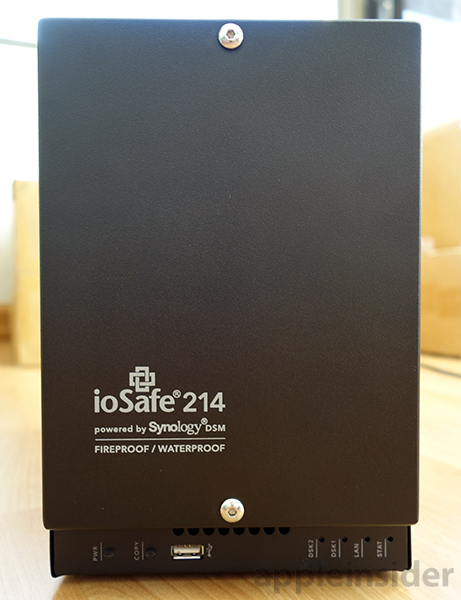 The 2TB (2x1TB) ioSafe 214 as reviewed can be purchased through ioSafe's website for $899, while a 6TB (2x3TB) option is also available for $1,499.